Yesterday when I walked into church, one of the staff members handed me the card featured in the above photo. Our church has a place on its website where you can share your story. Several months ago, I felt the Holy Spirit’s prompting to share my knitting/book journey with them. I had forgotten I had done it, until I saw that card. 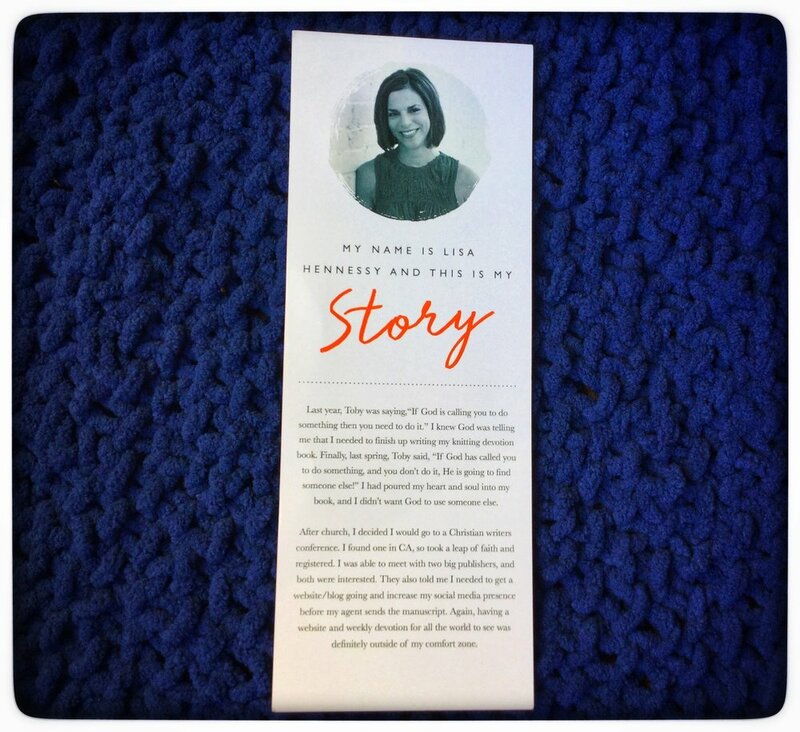 I shared how in faith, I stepped out of my comfort zone and pursued getting my book published and starting this website/blog and what a blessing it is for me that I can share the love of Jesus through knitting items to give away to people. During the church sermon, the pastor mentioned Hebrews 13:16 and how our country is in such a a bad place with all of the division and anger. He challenged us as Christians to be a church of love and kindness and for us to be the light of the world in which Jesus has called us. We are called to love everyone, despite our political or religious beliefs. Hearing sermons like this, are affirmations that my knitting ministry is what I need to be doing. While it may not seem like much, I know by knitting, praying and sharing with others, I am doing what I can to advance God’s kingdom. God has gifted me with both a love for writing and knitting. Hebrews 13:16 reminds me that God is pleased when I do good and share with others. Why would I not strive for this on a daily basis? How does this scripture speak to you about stepping outside of your comfort zone? While my story has to do with loving others through my hands and heart to share the love of Jesus, you don’t have to be a knitter to embody Hebrews 13:16. What can you do in your corner of the world to live out this scripture? Where is God calling you to usher in His glory in someone else’s life? Where or who can you shower love and kindness to this week? God WILL do something in you when you bless others in His name. Help me to bring the light of Jesus to someone this week. I thank You and praise You that You are able to use someone like me as a vessel to share Your love with those around me. Lead me to someone that needs to have words of hope spoken into their hearts. I pray these things in the name of Jesus. Amen.